It said it so eloquently, as kids' actions often do. Character. Something Kathy's son has in abundance. And something the Boy Scout still need to learn. haven't read the article, but attaining the rack of Eagle should mean something, my husband didn't bother with the project because a lazy leader let him slide on some of the harder merit badges. Really, the whole thing is too much like an Old Boys Club and often that isn't a good thing. Males who are MEN do not hurt children, no matter what their orientation is. Too often it is an older boy or a straight "nice, quiet" man who does the damage. Our children should be protected! as for Boy Scouts? Too little, too late with a double standard. That was a great story. 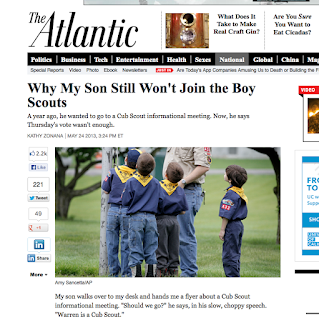 I think it's notable that the kid was sad about it -- he really wanted to join Scouts, but even with the choice left up to him, he did what he thought was right, rather than what he thought would be fun. Now THAT'S character.